Anyone can roast a chicken. It is the truest fail-safe option for cold-weather dinners (or, really, warm-weather dinners, too — it’s always good). The problem is that even as it comforts and satisfies, roasted chicken can also feel a little predictable. But as with all classic dishes, there are levels to it, and the menus of New York City restaurants are overrun with new roasted chicken dishes that are more involved and more creative than anything you’d make at home. Here are 12 chickens around town that will get you ready for fall and might just possibly restore your faith in poultry. In what may be the year’s fastest comeback, Einat Admony’s Balaboosta is back after shuttering in late May. 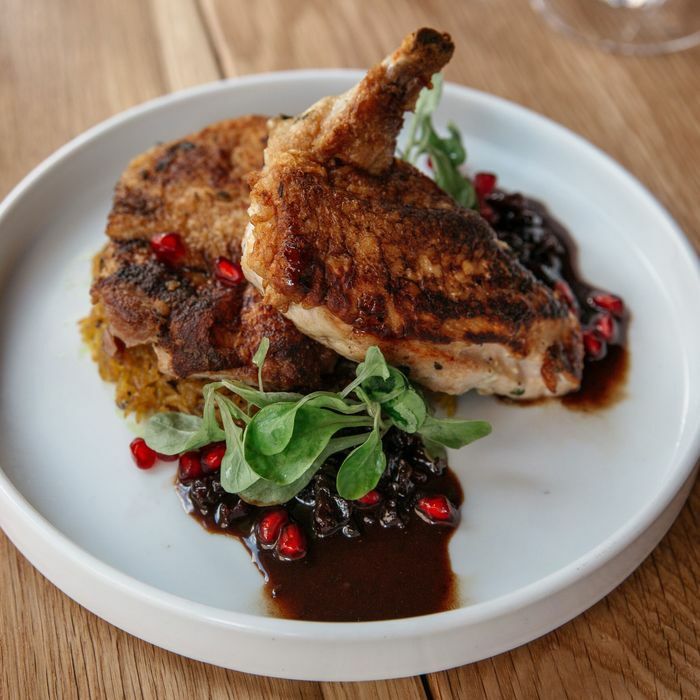 For this sleeker version of the Middle Eastern standby, Admony combined a walnut-pomegranate fasanjoon sauce that she’d been using at her restaurant Bar Bolonat with a brick-chicken dish served at Balaboosta 1.0. A deboned half-chicken is marinated in oil with parsley, garlic, and thyme and then cooked in a cast-iron skillet with a vintage iron pressing it down. Admony then gets rid of any remaining moisture in the skin in the oven before serving the dish with tahdig rice with cumin seeds and the aforementioned fasanjoon sauce with molasses, chicken stock, saffron, and Persian lime. If you’re on a budget, but still want to partake in the roasted-chicken bounty, Adda is the way to go. At Long Island City’s newest and buzziest Indian restaurant, chef Chintan Pandya serves what might be the world’s crunchiest and most tender chicken leg covered in an herby crust and served with mustard and red onions. Plus, it’s cheap enough that you can order some $2 naan and still have plenty of money left over for a generous tip. 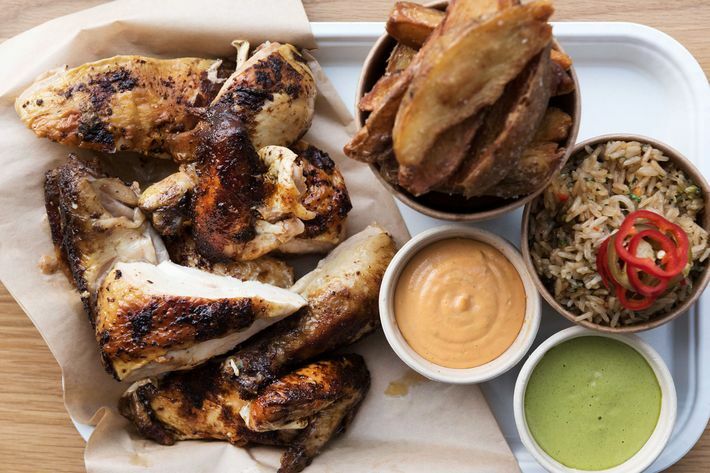 This new West Village counter shop from Llama Inn chef Erik Ramirez may be known for its sandwiches, but don’t sleep on the pollo la brasa, the restaurant’s take on roasted chicken. To start, Ramirez brines and trusses his chickens before smoking them for an hour over a mix of cherry and apple wood and marinating them for 24 hours. Finally, they’re cooked rotisserie style for another hour before they go out the door. 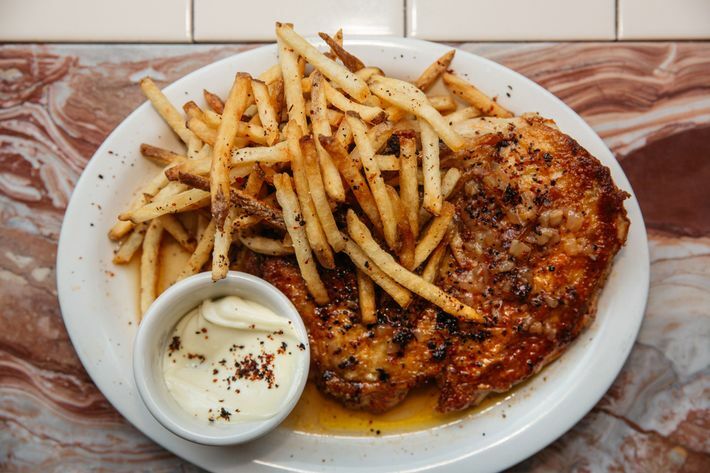 At this Tribeca restaurant, the chicken is first brined in a salt solution infused with black pepper, fennel seed, rosemary, thyme, lemon rind, and juniper. After four hours, it’s removed from the brine and stuffed just beneath the skin with compound butter mixed with black Australian winter truffled-duxelle, parsley, tarragon, capers, lemon zest, and fresh thyme, resulting in post-roasted bird with a crispy skin. To finish, the kitchen prepares pommes Anna, basically a buttery potato cake made of thinly sliced tubers, and truffle-infused red-wine jus. The chicken at this Argentine-inspired restaurant is less roasted than taken right to the edge of charring. Chef Norberto Piattoni hangs whole Snowdance Farm chickens (organic and raised in the Hudson Valley) over the hearth of the restaurant’s fire and finishes them on the restaurant’s grill. The final dish features leg and thigh or breast meat served with charred sourdough-bread sauce mixed with a rich mole, braised Appaloosa beans, and grilled baby bok choy. For his Little Italy–fied take on chicken, chef Tim Caspare serves the bird with roasted tomato pesto, basil, hazelnut, onions, garlic, and Jimmy Nardello Italian peppers, a sweet heirloom variety. Before that, the thighs and chicken breast are roasted on the bone in the restaurant’s wood oven (fired up with hickory, oak, and cherrywood) and then seared in a cast-iron pan in grape-seed oil and served in its own juices with butter, garlic, and rosemary, skin side down. This poultry dish has become an unexpected hit at the seafood-centric Cervo’s, and for good reason. First, the kitchen uses smaller chickens from a farm near the Finger Lakes, so one person can comfortably tuck into the dish. The chicken is deboned, salted all over, and covered in a dry rub made with smoked paprika, coriander seeds, lemon zest, and spicy piri piri chili. After two days in the rub, the half-chicken is cooked on the restaurant’s plancha on medium-low heat (it’s pressed with a little weight at the beginning and then cooked as is), hit with lemon and olive oil to mellow out the spice of the piri piri, and served in a garlic-based chicken broth with fermented hot sauce. If you want to take a more specialized route to eating roasted chicken, the yakitori at Nonono, which opened in June, pretty much covers all the bases. There are the more standard sections: thigh, breast, and wing, and then there are those parts of the chicken that aren’t for chickens: heart, liver, gizzard, knee and back cartilage, and oyster (supposedly the best part of the whole bird). Best part, all of the leftover bones go into Nonono’s ramen. That’s about as low waste as it gets. If you drop by the new Stateside location of this London-born restaurant for dinner with a friend in tow, consider going for the spiced chicken. Before hitting the oven, it’s slathered in butter, rosemary, lemon zest, Maldon salt, and five spice, and then roasted and basted for 50 minutes before being served with a traditional English bread sauce seasoned with bay leaves, thyme, onion, cloves, nutmeg, and a vermouth-spiked jus gras. For this very new menu item, the chicken breast is herb-brined and then roasted in mustard crème fraîche. Meanwhile, the chicken legs and thighs are cold smoked, marinated in kaffir lime, and grilled. That’s served with celery-root rémoulade while the breast gets finished with chilies and a Thai basil salad. When Christina Lecki took over the kitchen at Andrew Tarlow’s Wythe Hotel restaurant a year ago, she told Grub that she wanted to “make it a little slower, a little more simplistic.” Fair, but Lecki still finds ways to surprise and impress diners. Take, for example, her take on “simplistic” roasted chicken. After three hours in salt and two hours over the restaurant’s hearth, the chicken is finished in the restaurant’s wood oven. Lecki’s team then uses the chicken’s backbone to make a stock, confits its gizzards, and sautés its heart and liver to make a pan sauce with garlic confit. The finished plate comes together with a creamy purée made from roasted red kuri squash. 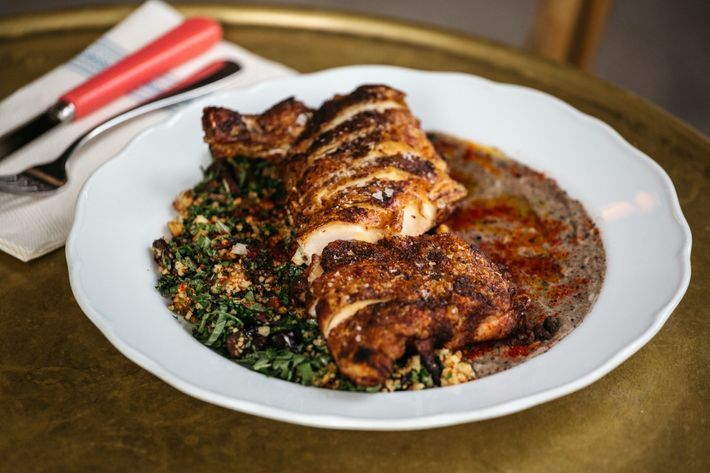 This dish is a nod to the long-standing cultural exchange between France and North Africa, starting with a half-chicken placed in finely ground sea salt for one day and then rubbed down with ras el hanout, a North African spice mix made with warm spices like cinnamon, cardamom, and allspice, as well as coriander, cumin, paprika, and mace. After a day in the dry rub, the leg bone and thigh bone are removed from the chicken, and it’s pan-roasted (skin down) on the crown to maintain its shape. The finished bird arrives tableside thinly sliced and covered with spicy olive oil and esplanade chili powder, alongside a smoky eggplant purée that’s not unlike baba ghanoush, and couscous flavored with preserved lemon, almonds, oil-cured Moroccan olives, end-of-season nectarine, parsley, and mint.